Is the Myanmar Army resorting to new tactics to mask a crackdown? Rohingya refugees that have fled across the Naf river into Bangladesh say that the Myanmar Army is resorting to new tactics, including the use of civilian vigilantes, to mask a fresh crackdown on the Muslim minority in the country’s troubled Rakhine State. 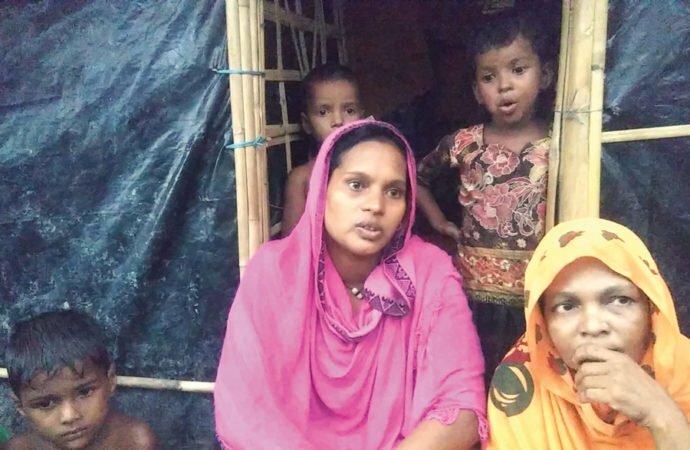 The Dhaka Tribune gathered consistent descriptions about new forms of violence that have been unleashed in Rakhine in interviews with newly arrived Rohingyas in the Balukhali area of Ukhiya upazila in Cox’s Bazar over the last two days. Since the fresh military crackdown which reportedly began from the second week of August, there has been a renewed influx of Rohingya refugees into Bangladesh. Several videos purportedly showing Myanmarese soliders torturing Rohingyas are circulating on social media, but their authenticity could not be independently verified. A UN field agent, refusing to be named, told the Dhaka Tribune that during the first three weeks of August, 700 families have fled to Bangladesh. The Myanmar Army was heavily criticised last year after the UN said its offensive against Rohingya villages amounted to crimes against humanity. Naypyidaw has rejected the charges, arguing that it is hunting militants in Rakhine. Based on interviews with two familites, the Dhaka Tribune collected graphic descriptions of the latest tactics deployed by the Myanmar Army. On August 18, soldiers surrounded Bali Baazar, a village in Rakine, “to look for extremists”. A new mode of terror? When the Myanmarese Army surrounds a village, they tend to shoot 3-4 blank rounds to announce their arrival. There is a language barrier as the army is largely composed of Burmese-speaking soldiers, whereas Rohingyas speak Arakan. “The Myanmar military raided the houses and they were shouting outside ‘En Ma La!’ (come out from the houses) and ‘Ammia La Ba!’ (why are you late? Come out fast),” said Abdur Rob, who fled to Bangladesh on Saturday. The Myanmar Army also uses young men from the Mogh community, which are local Rakhine Buddhists, to raid the Rohingya houses. “Because the army’s horrifying actions have been recorded and circulated on social media, they were compelled to change tactics,” Rob said. The army’s crackdown have been defined as crimes against humanities by a UN fact-finding team after the October 2016 crackdown. The latest Rohingya refugees said the military’s main target is to find “Bagi”, a term used for suspected insurgents or extremists. Many men have fled their houses, afraid of being accused of being a “Bagi” and detained by the army. Rohingyas have also been accused of murdering other Rohingyas in Kya Maung village. Newaj claimed the accusations were baseless. When the new refugees were asked if the humanitarian agencies still have access to the village tracts, they replied that UN agencies or any international NGOs have very limited access to locations where the army is operating. Various Bangladesh-based international NGO workers said their colleagues have received very limited acces to those villages, namely Cha Ni Para, Keyari Para and Mohali.